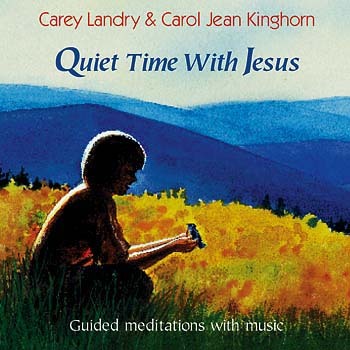 Teach children a new form of quiet prayer and reflection with these songs and stories from Carey and Carol Jean. This 8-song CD from Carey Landry and Carol Jean Kinghorn was designed for children and young people, but reaches all ages. The collection is used by everyone from teachers and catechists in the classroom or parents at home to teens and adults at group retreats or in personal reflection. This 8-song MP3 album from Carey Landry and Carol Jean Kinghorn was designed for children and young people, but reaches all ages. The collection is used by everyone from teachers and catechists in the classroom or parents at home to teens and adults at group retreats or in personal reflection. Quiet Time with Jesus draws a gentle image of a God who comes to us in quiet and peace and loves us deeply. Beautifully composed and presented, the songs invite us to enter into the meditations over and over again, to "be still and know that I am God." Carol Jean's gentle voice guides children through the stories and prayers against a backdrop of Carey's familiar songs and peaceful instrumental music. Carey and Carol Jean designed the collection for children and young people, but it can reach out to any age. Quiet Time with Jesus can be used by a teacher or catechist in the classroom, by a parent at home, or by teens and adults for group retreats or personal reflection. It can help young people prepare for confirmation, First Eucharist or first reconciliation and it will teach them a new form of quiet prayer and reflection.